1 - 11 $47.50 ea. 12+ $42.50 ea. GE 33279 Q6.6A-PAR56-3 200w - Elevated Approach Lamp - Airport Lighting - Description: This GE 33279 is a airport lighting halogen lamp 6.6 Amper/200 watt Par 56 with 2 screw terminals. 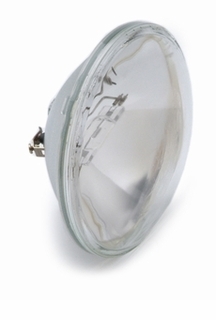 CC-6 filament.The front lens is clear and MOL is 4.5" and OD is 7". Life is 1000 hours. Nominal light output is 30000 at center.CBCP-200000.Burn position both.